Location: Canyon Lake is an 8,500 acre reservoir located on the Guadalupe River near New Braunfels, TX. The reservoir is deep, the water is clear, and the shorelines are primarly rocky and steep. 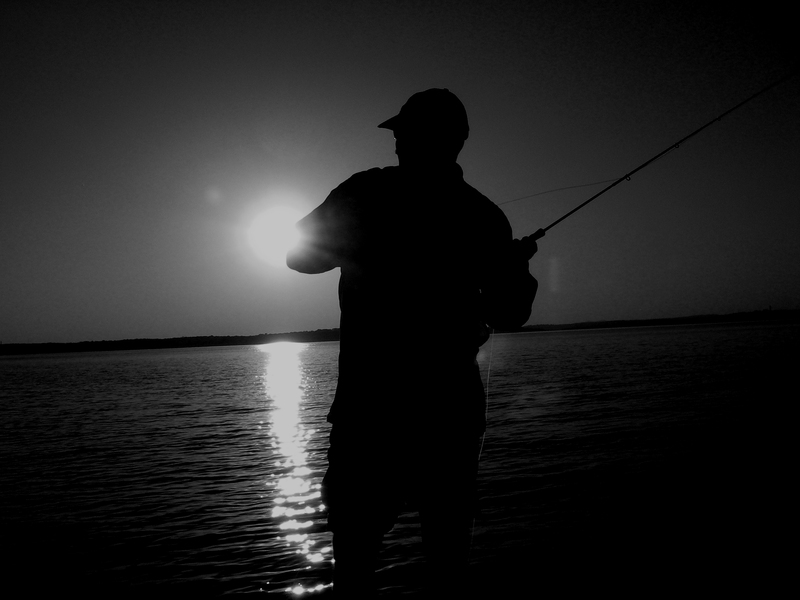 Game fish: Canyon Lake is home to a variety of gamefish including largemouth bass, smallmouth bass, spotted bass, Guadalupe bass, striped bass, white bass, common carp, catfish, and longnose gar. Forage species: Canyon Lake’s forage base consists primarily of threadfin shad, gizzard shad, sunfish, spottail shiners, crawfish, and burrowing mayflies. Fly Tackle: There are two basic fly fishing rigs I use on Canyon Lake. The first is an 8wt. rod outfitted with a fast sinking line and a short (5 ft) 17 lb test flourocarbon leader. This rig gets flies deep and it is a good choice for casting to stripers, largemouth, smallmouth, white bass, and longnose gar. The second rig I use is a 6 wt. outfit rigged with a floating line and a long (9ft) 10lb test leader. I use this rig for sightcasting carp & for casting to schooling fish like white bass, largemouth bass, and small stripers. Flies: For large species like stripers, largemouth, smallmouth bass, I throw a fly I call a Chrome Minnow. 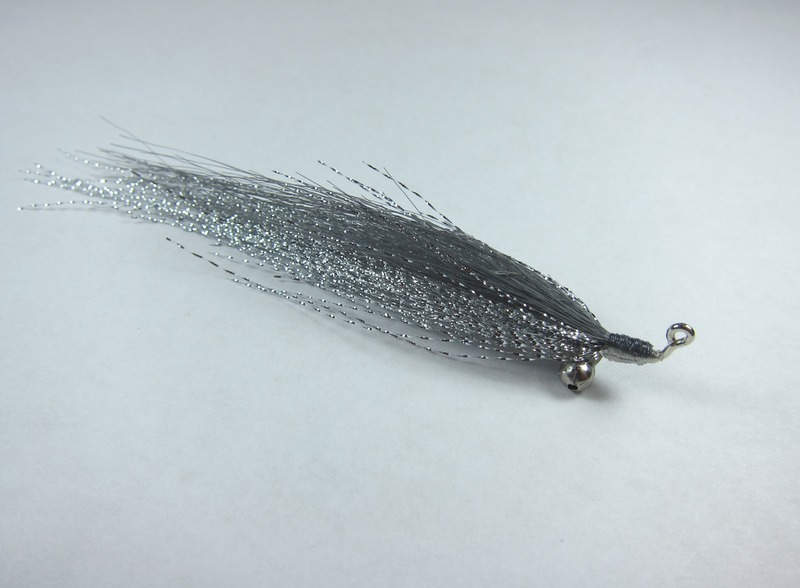 A Chrome Minnow is a Clouser-style fly tied on a 60-degree jig hook with a silver Krystal Flash body and a back made from a touch of grey synthetic fiber (learn how to tie it HERE). 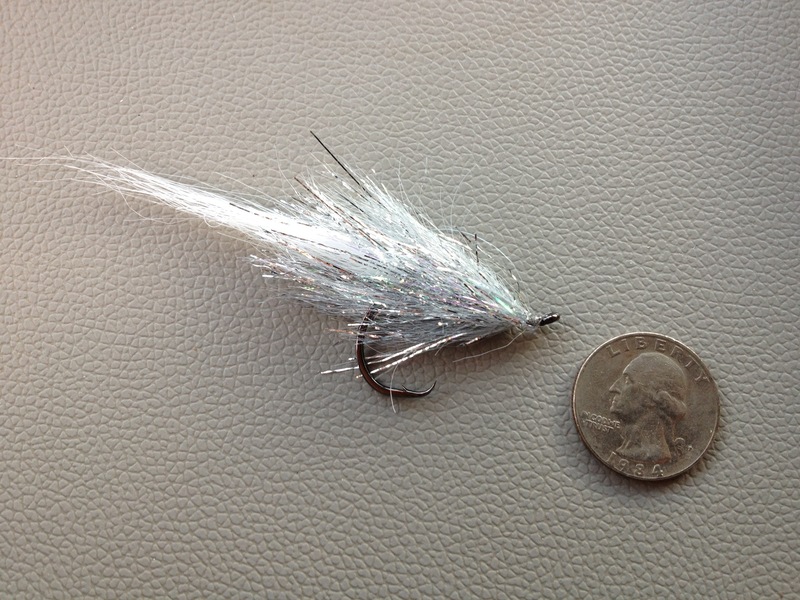 A Chrome Minnow is THE fly for Canyon Lake. Ocassionally chartreuse or pearl works well, but chrome is a sure bet. 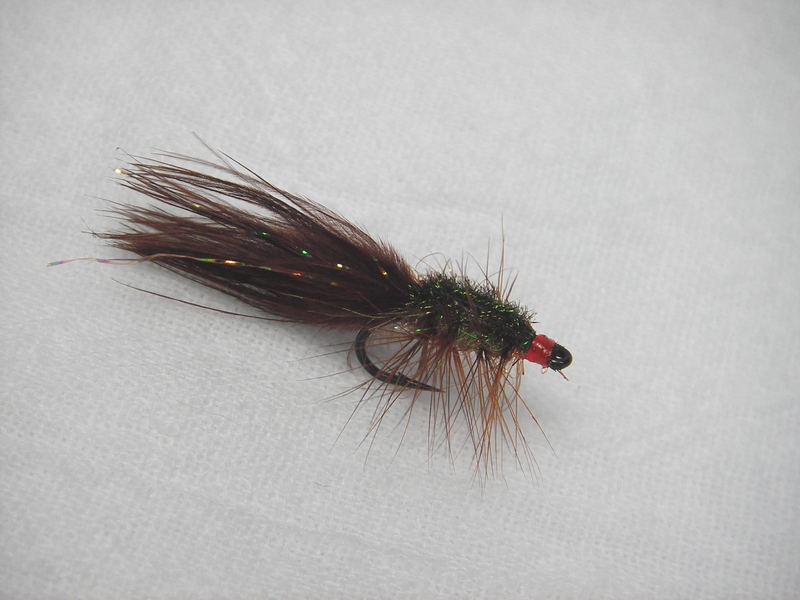 For carp, I throw a small nymph pattern I call the Canyon Carp Fly. I have found no other pattern that Canyon carp will eat as readily. For longnose gar, I use large streamer patterns tied on circle hooks. Circle hooks are effective at snagging the gar’s slender snout. Fish the fly with a slow steady retrieve and use firm tension to set the hook. Use gloves to handle the fish. they have sharp teeth and scales. 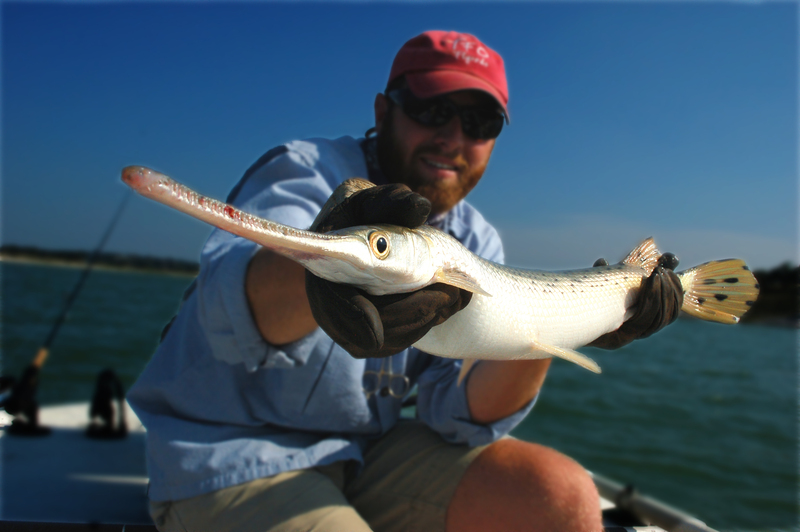 There are generally good concentrations of longnose gar near the hump directly west of Crane’s Mill Point on the extreme upper end of the lake. Strategy: Canyon Lake is clear and clean and has a limited capacity to produce plankton and forage fish. 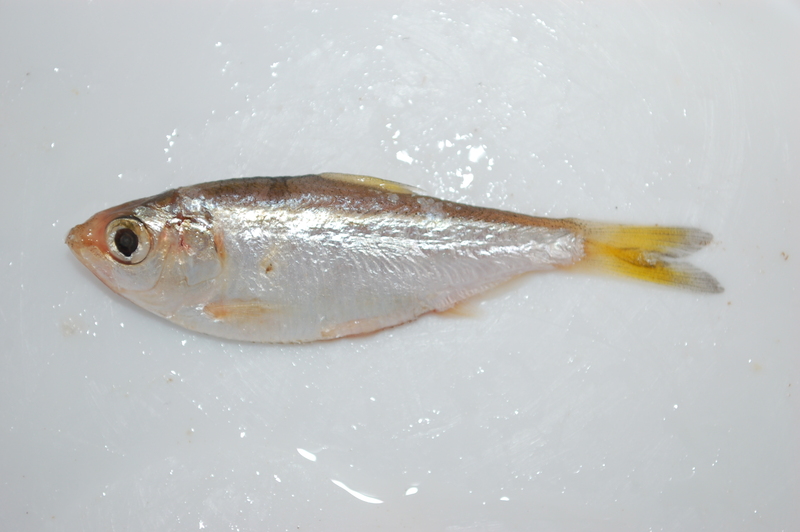 Because the biomass of forage is relatively small, finding concentrations of forage species (like threadfin shad) is a key component to catching fish. Two sayings are true here: 1) “90% of the fish are in 10% of the lake,” and 2) “Find bait and you’ll find fish.” The best way to find bait is to spot them jumping on the surface, or chart them on an electronic graph/fish finder. Seasonal Cycles: In the spring, concentrate on the upper end of the lake (up-lake from Tom Creek area) and on creek channels, shallow points, and flats. 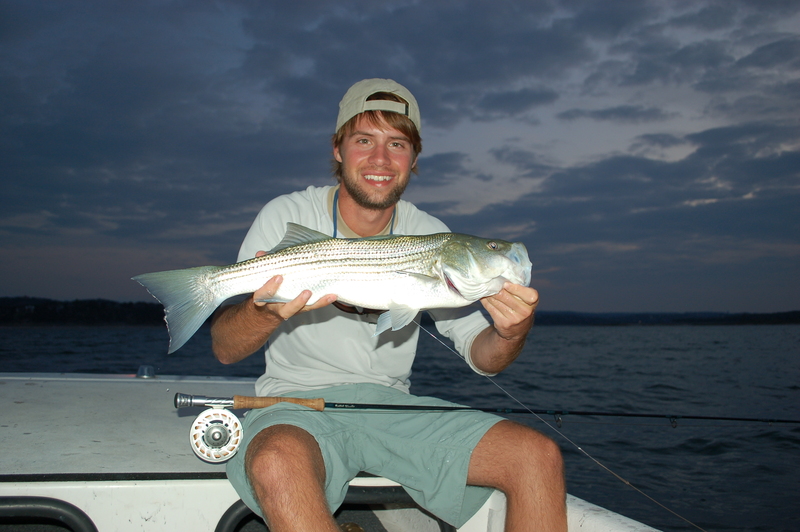 Look for stripers schooling early and late on clear days and throughout the day on cloudy days when the water is 68–78 F.
In the summer, fish deep. Concentrate on steep shelves, shaded areas, and creek edges. Fish early and late, avoiding the weekend boat-show. Longnose gar will be concentrated directly West of the tip of Crane’s Mill Pt. and will stay there through early fall. At daylight and dusk, carp will tail in the back of Jacob’s Creek, Tom Creek, Comal Creek, and on the North shore flats between Potter’s Creek and Canyon Marina (Pappa Dock’s). In the Fall as the water temperature begins to drop, look for schooling action at the surface on the lower end of the lake between Jacob’s Creek Pt. and the dam. Generally, the open-water hump directly in front of the dam is riddled with some sort of schooling activity at daylight and dusk. 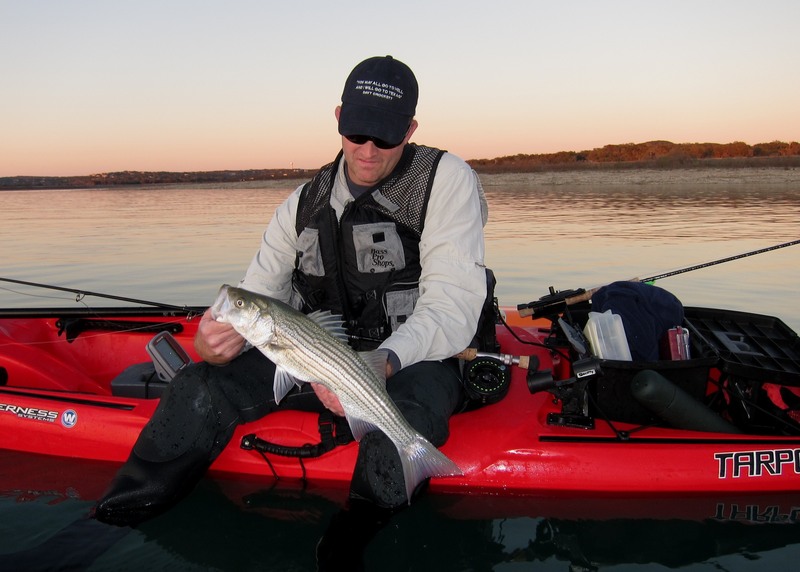 Striped bass will feed heavily at the surface on cloudy days in the Fall from the last week of Sept. until the middle of December. In Winter, look for fish in creek channels and coves. 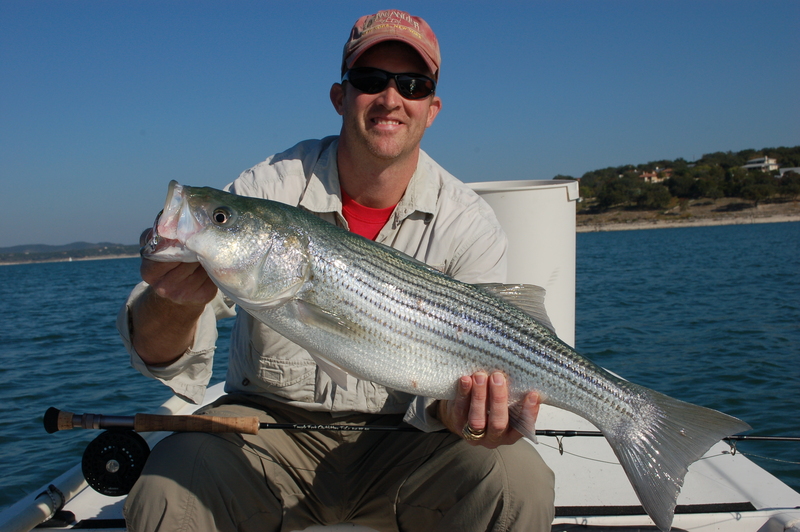 Deep holes and shelves in the Comal Creek and Jacob’s Creek area often hold fish, especially big stripers, from January through early March. Fish slow and steady. Attached below is map with three locations you can catch gar from Jun. through Oct. Location #1 is the best. BION I’m impessred! Cool post! Casey – Are the carp spots you mentioned accessible on foot? You can access the back of Jacob’s Creek via the entrance (swim beach area) of Canyon Park. The inside shoreline of Comal Park is also good and is accessable. I noticed you kayaked from a launch near the dam. Are there other kayak friendly launch spots on the lake. I’m most interested in carp and black bass on the fly rod. Have thoroughly absorbed your website tonight and find a lot of terrific information. I’m currently president of a kayak fishing club in Houston and we have monthly meetings with speakers. Check out packtx.org to get a feel for who we are. Also a relatively new TFF member. I’ve heard many of those guys refer to you and that is what led me to your site. Very informative articles and very generous of you to share your fly recipes. Glad you liked the site. I am familiar with your organization through posts on the TKF website. I have fished Canyon for many years in both skiffs and kayaks. Most of the public boat ramps and the shorelines within the different park boundaries are “kayak friendly.” The ramps are a bit steep but not that bad. Parking is generally not a problem. BUT, traffic on the lake in the warm weather months, especially on the weekends, becomes congested (along with the ramps and parks) and makes it what I would consider a sometimes not-so-safe place to paddle. You can stick to the shorelines and avoid the traffic mostly, but wakeboarders and jetskis will be buzzing everywhere. I always avoid Canyon on the weekends. Carp can be found mostly in the backs of coves (Jacob’s Creek, Comal Creek, Potters Creek, Tom Creek) at first light during the warm weather months. They will feed on small black or dark brown-orange flies presented on or near the bottom with a slow retrieve. You’ll see them tailing and digging in the silt/gravel, but the cruisers are often easier to catch. Have had some terrific days fishing for them on the shorelines on either side of the narrow road that leads into Canyon Park on the N. side of lake. These areas are some of the few spots with gently sloping banks and soft mud/gravel bottoms the carp like. Largemoth bass are scattered around the lake. Most of the shorelines mentioned above are good spots. Fish a sinking line and try to get deep. Some of my best catches have come in 10-15 feet of water along steep rocky shorelines. The largemouth in Canyon, for whatever reason, seem to fight disproportionately strong for their size. They are good fighters.